Modern gun ordering looks quite a bit different from how consumers purchased firearms in the 1800s. Today, buyers can check a wide range of wholesalers, chain retailers, and large distributors to order a firearm which can be shipped to their local licensed dealer. In the old days orders were made by letter, telegraph, and even showing up in person to a number of East Coast firms. Individuals could order directly from firms, but many of the gun shops around the country also placed large orders. The largest wholesaler of the mid-1800s was a firm called Schuyler, Hartley, & Graham. The partnership worked out of New York and had been founded in 1854 by Jacob Schuyler, Marcellus Hartley, & Malcom Graham. The founders took advantage of the Civil War to quickly grow their business. They recognized the potential for a long war and quickly began brokering supplies from Europe for Federal and state governments. The trio supplied everything from cannons to camp supplies and formed the foundation for a booming post war business. This order placed in 1896 is for 40 Model 1842 Muskets. While well obsolete, they were still serviceable arms, and could be valuable on the frontier. Image courtesy the McCraken Research Library. When the Civil War ended the US government, along with state governments sold off much of their surplus stock of arms and equipment. The official agencies that had often paid premiums for the same supplies during war time, were now selling them at a major loss. This glut of surplus meant cheap goods for consumers, but made a tough market for dealers. SHG turned, in part, to foreign sales. When the Franco-Prussian War broke out, they began receiving orders from the French government. The conflict in Europe consumed the arms surplus in the United States. It also established SHG as an international dealer. With their connections and experience, SHG stood ready to become the most prominent firearms dealer of the 19th century. The McCracken Research Library at the Buffalo Bill Center of the West holds the existing sales records for SHG. These papers are a valuable resource, and can be viewed online. Researchers can study what kind of guns were being used in America at the time through these records. Herb Houze, Curator Emeritus of the Cody Firearms Museum, wrote a book on the subject titled, Arming the West. As the book, and SHG’s records show, the firm sold a wide variety of arms to meet the demands of Americans pushing westward in the late 1800s. SHG sold everything from the latest lever actions to surplus military muskets over a half century old. 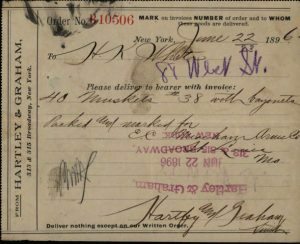 One record from the 1890s shows a sale to St. Louis of a case of US Model 1822 Muskets. Government arsenals originally built these flintlocks and later converted many to percussion before surplussing them. Even among all the firearms advances of the 19th century, there was still enough demand to sell a simple musket. The guns, regardless of how advanced, and the company that sold them, are important parts of the history of the West.